Finish applying the tanking membrane to the retaining wall. Finish cutting the rebates in the rammed earth for the suspended slab forms. Backfill the void with free-draining but not sharp edged aggregate. Move my 1000L water tank which I have rather inconveniently placed right in the middle of my soon-to-be-earthworks. D’oh! Begin excavating and levelling the site of the first floor slab-on-ground. Dig footings for the slab. Use the spoil from the excavations to form up a spoon drain behind the retaining wall to divert surface water away from the wall. Form up the slab-on-ground and suspended slab. In preparation for step 5 (who says I don’t plan ahead! Wait, what’s that? A water tank? 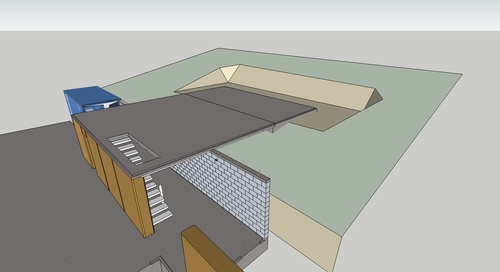 Oh…) I’ve been spending some time in Sketchup, modelling the hillside and the cutting I will need to make for the slab. While onsite on Sunday I measured the extent of the slope above the retaining wall and came up with around 12º. No, I didn’t use a protractor or a sextant, or anything as quaint as that - I used my Swiss Army Phone. I love technology, my phone has a 3-axis accelerometer which enables a spirit level app to measure the precise angle at which the phone is being held. Lining the phone up with the water level in the tank produces a 12º downslope!